Hooray, it’s the weekend – that 48 hour blip when we all catch up on life – housework, washing, shoppingn and if you have kids, it’s that time for near-family breakdown as, last thing on Sunday night, your offspring retrieve their schoolbag form where they flung it on Friday evening, and begin their homework. So, here’s an unsolved mystery – the Mary Celeste. Being a lazy chap, I have «borrowed» the Wikpedia entry on the mysterious fate of this ship and her crew (I have to say it is succinct and well written and I certainly could not have done better. Mary Celeste (often misreported as Marie Celeste) was an American merchant brigantine, discovered adrift and deserted in the Atlantic Ocean, off the Azores Islands, on December 5, 1872. The Canadian brigantine Dei Gratia found her in a dishevelled but seaworthy condition, under partial sail, and with her lifeboat missing. The last entry in her log was dated ten days earlier. She had left New York City for Genoa on November 7, and on discovery was still amply provisioned. Her cargo of denatured alcohol was intact, and the captain’s and crew’s personal belongings were undisturbed. None of those who had been on board were ever seen or heard from again. What might have happened to the crew of the Mary Celeste? What could have been their reasons fo abandonning ship? They might have been kidnapped by Aliens? They could all have just decided to go for a swim during the middle of dinner. Looking for more exploitable and «teachable» unsolved mysteries, I suggest one of the greatest mysteries of all time. Okay, so three bears living reasonably comfortably in a small house* in the woods, suddenly, during breakfast one morning, decide to go for a walk, and they don’t even lock the house when they’re gone. *I say small house because mummy, daddy and baby bear all shared the same bedroom, so I guess we are in some kind of one up, one down cottage. Imagine, you are in the middle of breakfast, perhaps not yet fully awake and therefore, not quite in your state of full mental awareness. You are waiting for your porridge to cool down and suddenly you just leave the house and go for a walk. Why? I don’t know about you, but I take breakfast as soon as I get up, so I’m still in pyjamas and I certainly wouldn’t go for an early morning walk in my pyjamas, except to put the dustbins out or retrieve my morning paper from the letterbox. What made daddy bear just walk out the house and what made mummy and baby bear follow him? A strange far off noise or lights in the sky – some distant and untoward event that merited closer investigation? It can’t have been all that «untoward» if the bears later returned. Perhaps daddy bear just decided he needed a stroll around the garden whilst his porridge cooled down, and mummy and bear simply followed him outside – for we do not know actually how far the three bears went or even where they went or how long they were gone. Obviously they weren’t going far because they didn’t bother to lock their house. However they were gone long enough for Goldilocks to eat their porridge and have a nap. Of course, the three bears lived in more reassuring times and they lived in the middle of a forest – they didn’t need to be as security conscious as modern bears. Unless of course, they simply rushed out the house so fast that they forgot to lock it or mummy and daddy bear were suffering from mild dementia or perhaps they were just stupid. What if they had locked the house? Well Goldilocks might never have got in. So, at an unspecified time of the morning on an unspecified day, a blonde girl (of unspecified age) is walking through the woods on her own. Why? Is she too simply out for a walk in the middle of breakfast? In some versions of the story, Goldilocks is a «little» girl. Why would a little girl be wandering around the woods on her own? Is she lost? Has she been abandonned by her parents? We know that Goldilocks is suffering from hunger and fatigue – she needs food and a bed – quite logical that she may venture into an empty house in search of sustenance and rest. If this last scenario were the case, We can assume that Goldilocks has been on the road for some time. Is she running away from some one? The girl needs help though. Just as well she found the bears’ house and not Hansel and Gretel’s bewitched, edible cottage. Let us assume that Golidlocks is not «a little girl» but a teeanger advancing into adulthood. She might just be crossing the woods as a short cut home form a wild all night party. She might be fleeing from a gang of people smugglers? 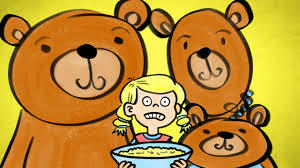 Or is there something more malevolent in the Goldilocks mystery – is she actively seeking the bears to steal their porridge? Was it indeed Goldilocks who created the diversion that made the bears leave their house? Fairy tales are good for this kind of probability exercise. Sleeping beauty for example – why wait 100 yars for a young prince to come and cut your hedge? A good gardener with a decent hedge timmer would have done it far sooner and far quicker. The Seven Dwarves – They own a diamond mine for chrissake, but they live in a small cottage and all sleep in the same room. They don’t even employ a housekeeper – they wait until a princess comes along to do all the cooking ad cleaning for free. Are these dwarves just plain mean or is their some kind of sexual or masonic motif? Hey they all sleep together then along comes Snow White and no one even makes a play for her. What if Cinderella hadn’t lost that glass slipper? What if Munchkin laborers had gone on strike and not finished the Yellow Brick road before Dorothy blew in? And what if I didn’t manage to find some plausible way to end this post? And what did happen to Goldilocks? Posted in Culture, drifting, Education, Family, Food, language lessons, Philosophy, Weekend and tagged fairy tales, Goldilokcs and the three bears, mysteries, porridge, unsolved. Bookmark the permalink.